Battambang  is Cambodia's second most populous city and a popular tourist destination due to the many nearby ancient temples, Buddhist shrines and the infamous bamboo railway. It is also the capital city of the Battambang province. It is popular with tourists because of it's blend of modern city, small-town friendliness and some well-preserved colonial architecture, which works together to give the town a unique charm. Battambang's ever increasing variety on food and coffee is a refreshing change from more remote destinations in Cambodia, and has the potential to be as funky as Thailand's Chiang Mai, minus the hordes of tourists. And yes, you can have your latte and your piccolo like you never left home. 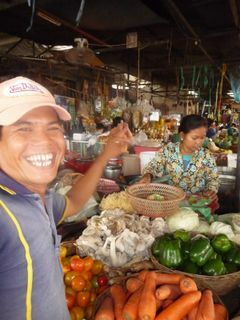 Battambang was established as an important trading city with around 2,500 residents in the 18th century. They lived mostly along a single road parallel to the Sangkae River. In 1795 Thailand, then Siam, annexed much of northwestern Cambodia including the province of Battambang and Siem Reap. The Abhaiwongse family (a Khmer family of noble origin) ruled Battambang as governors for the Siamese for six generations until 1907 when the province was ceded to the French to be part of their French Indochina colony. Following the colonization of the French in Battambang the colonial administration developed an urban layout which enlarged the size of the French colonial town. 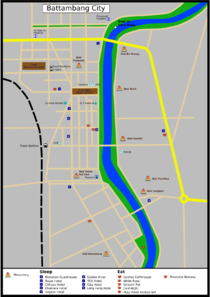 In the first time development, they constructed a grid pattern of well-defined streets, put in the urban structures and built three main streets parallel to the Sangker River, connected the both side with two bridges in 1917. Military purposes and prison infrastructures were erected inside the compound. 19 years later, a second urban development plan was created with a newly constructed railway linked from Battambang to Phnom Penh. The urban structure was extended to the west of the town, featuring some important urban axes orienting on the railway station. Many outstanding buildings like residential villas and significant public buildings were constructed during that period. According to the third urban development plan for Battambang, a large extension was planned for the north, east and south of the city. The urban layout was technically planned and required long-term thinking to create an urban axis corresponding to the existing urban layout from the former period. Battambang grew as a modern provincial capital, and became the most developed part of all provinces in Cambodia. Several large infrastructures and public facilities were built under the modernization program of the Cambodian government under Prince Sihanouk. Several provincial departments, the court house and other public administrations were set up on both sides of the river. Textile and garment factories were built by French and Chinese investors, the Battambang Airport was constructed, and the railway line was developed to reach Poipet. Numerous schools and a university were built. A sports centre, museum and an exhibition hall were constructed to serve the cultural needs of the growing population. National Highway 5 is paved and from Battambang runs southeast to Phnom Penh and northwest to Sisophon and Poipet. At Sisophon, National Highway 6 branches off to provide paved access to Siem Reap. In a car, Phnom Penh is around 4 hr away and Sisophon can be reached in just under 1 hr. By bus, Phnom Penh takes about 5-6 hr and cost about US$4. Siem Reap takes at least 3 hr and costs $5 ($6 at a local tour provider). UPDATE: March 2014, buses are no longer allowed to drive into the city. The new bus station is about 3 km west of the city centre. A tutuk to the city centre will cost about $1. The major bus companies, e.g. Capitol, Sorya, are still running their offices in the city and offer a free minivan transfer to the bus station. Smaller companies will take you to their own offices where you are at the mercy of the two or so moto drivers hanging around (they'll insist the city is 8km. away). Highway 57 from Battambang to Pailin was paved in 2010. Paramount Angkor Buses run twice daily from Battambang to Pailin (2 hr) for $4. From Siem Reap there are buses at 7:30am, 10:30am and 13:30pm. The Capitol bus costs $4.50 if booking direct at their office in Siem Reap, plus they will pick you up from your accommodation for free if necessary. One boat a day travels from Siem Reap (for Angkor) to Battambang, departing Siem Reap at 07:00. An interesting and very scenic journey along small rivers, the boat threads its way through numerous charming floating villages and past dozens of towering cantilevered fishing net installations. It can take between 4-12 hr, depending on the time of year (and hence the water level), however the time can be fairly accurately predicted by checking the time that the same boat arrived yesterday. During the dry season, when the water level gets very low, the boats cannot get all the way to Battambang and the journey is completed by minibus or pick-up truck. As of January 2019 there is a weekly train connecting Battambang with Phnom Penh and Poipet. The train leaves Phnom Penh every Wednesday at 7:00h arriving in Battambang in the afternoon. On Thursdays the train departs Poipet station at 7:00h, arriving in Battambang between 9 and 10. Tickets are about 5$ and can be bought at the station. Reservation is possible through easybook.com. After a test phase the train will start running on a normal schedule, which is supposed to be every other day in either direction. This service is operated by Royal Railways. The city centre is quite compact and can be mostly explored by foot. Bicycles can be rented from most hotels or private companies for US$1-2 per day. Motorcycles can be rented from US$7 a day, or $5 for half a day. Some hotels rent bikes. The driving habits of locals are hazardous. Police may try to fine tourists on motobikes. If pulled over, stay calm, smile & take the key out of the ignition (to prevent the police trying to ransom it), and pay a small fine of US1-2. Arguing, waving your driving licence in their faces or otherwise upsetting the police is not recommended. Tuk-tuks and motorbike drivers hang around popular tourist areas. As most of the interesting and useful destinations are quite close to each other, most rides should only cost around US$2-4. 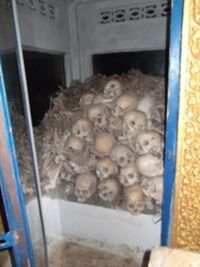 More distant trips like Phnom Sampouv (the 'killing caves') will cost around US$12, and can be combined with other destinations for a total of US$20-25. Small boats act as ferries (1000 riel) and cross the river in front of the market. Battambang is known for its statues which seemingly decorate every public place. Most are of animals (mythical and real) and divinities. The most famous of these statues is on the main road in from Phnom Penh and is of an ancient Khmer King holding a stick which he used to quell rebellions in the Battambang area. The name of the town / province comes from this legend. The town also has a number of fine early-20th-century French colonial buildings. Most of the colonial buildings can be found along the waterfront (St 1), especially just south of Psar Nat (which is quite impressive in itself). Famous Art Deco buildings are the Central market, the swimming pool Victory (riverside) and the train station. Along streets 1, 2, 21/2 and 3 are charming examples of Chinese, French and Italian architecture, with peculiar mirroring of houses constructed on one side in brick, square pillars and on the other one in concrete, round pillars. Street 3 has some charming French shop-houses. The Governors Residence is the most impressive colonial building, a legacy of the early 1900s with balconies and wooden shutters and grand reception room with a 5m ceiling. It was designed by an Italian architect for the last Thai governor, who departed in 1907. The interior is closed but you can explore the grounds at leisure. Battambang Museum (admission US$1) displays fine Angkorian lintels and statuary from all over the Battambang province, including Phnom Banan and Sneng, and it has multi-lingual signs. Phnom Sampeu (sometimes also “Sampov Mountain”), a hill with the Killing Caves of the Khmer Rouge, a few others caves adorned with Buddhist statues, and a monastery with two Buddhist Stupas on the hilltop. Entry is US$3 - and it takes about 1 hr to climb the circuit to the monastery on top, with a short-cut leading back down to the shops and restaurants which line the approaching road. Just before the ticket office, you can see a cave about 100 metres or so up the rock face. At around about 5.30 or 6pm (depending on sunset time) every evening, you can witness a steady stream of bats exiting the cave. It takes about 40 minutes for all the bats to leave. There must be tens of thousands of bats that make this journey every night. Some locals say over 1 million bats, but who knows? Whatever the number is, it's an amazing sight. From the main road, you should be able to see the bats forming various formations in the sky. This cave also features several restaurants in front of it with their seats turned towards the cave like an open air cinema. If you’re looking for a less crowded place, ask your driver to take you to the second cave, it’s approx. 500m down a road to the right (facing the mountain, heading south). Here you’ll have to hike up a small path to the left of the road for a few meters but get rewarded by a beautiful sunrise as a perfect background for the clouds of bats leaving the cave. Wat Banan,Entry is US$3 - the so-called mini-Angkor wat, an impressive flight of stairs lead up to a dilapidated Angkor-style temple which is still in use as a Buddhist shrine. Once at the top of the temple follow the trail on the south side of the hill. It will lead you down and eventually to a breathtaking cave. Huge sky light ceilings and plenty of bats. Wat Baydamram, a temple where hundreds of fruit bats live in trees under the protection of the Buddhist monks. Wat Ek Phnom, another Angkor-type temple ruin, about 15 km north west of Battambang. The road runs along lovely small rivers flanked by trees and small villages making it a generally nice area. Approaching Wat Ek Phnom, you suddenly encounter a giant Buddha statue in the Wat, which is certainly picture-worthy. The grounds of the Wat also have an Angkorian era temple which is in relatively good shape and with some interesting carvings. Entry US$1. There are several opportunities to explore villages just south of town. The cultural village of Watkor, just a few kilometres south of the town centre has several "ancient wooden houses" from the early 20th century. Further south are the agricultural villages of Kompong Seyma, and Ksach Puoy. For info call District Administration Battambang: ☎ +855 1288 1516, +855 1666 6111. Rent a bicycle and cycle along the river. Upstream (south) or downstream (north). Both directions are flat and mostly paved, and it is possible to cycle along the river bank for a considerable distance, of up to 20 km each way. Also worth trying are the unpaved roads, they are easy to cycle along, have nearly no traffic and there plenty of children to say hello. A good address for renting bicycles is The Battambang BIKE rental and repair directions="60 street 2,5" [email protected] ☎ +855 17 905 276 or Soksabike Tours on Street 1.5 offers city and mountain bike rentals as well (info above). The Bamboo Train: (The term "train" being used loosely - A large bamboo platform mounted on train axles powered by a small go-kart engine). A trip to the train can be booked in most hotels or arranged with a motorbike/tuk-tuk driver. 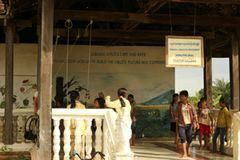 Currently it is regulated by Battambang's Tourist Police, with a standard rate of US$5 per person, minimum 2 people or US$10 for one person, with discounts for larger groups. It is worthwhile asking the driver to stop at scenic places. 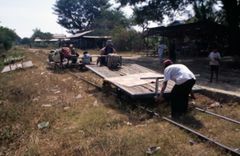 The old Battambang bamboo train has now been replaced by a new, more sedate (= safe), more modern one - ask at your hotel. Many restaurants around Battambang offer cooking classes at varying prices. Coconut Lyly - Street #111, 200m West of the Phsa Nat Central Market Battambang (Google Maps). Cooking course cost 10$ and are led by a young and enthusiastic chef. You cook traditional Khmer meals but you get a little more, as the website says: quality over quantity. Courses can include the shopping, you find yourself back watching coconut milk get produced freshly for the Amok you prepare. Ch'Ngainh Ch'Ngainh - a homely and familial approach to cookery carried out in a family home. ([email protected]) ☎ +855 12 63 93 50. Daily courses priced at US$10. Giving something back to the friendly and helpfull locals. There are plenty of places to eat but after 19:00 some places close and lots of streets become dark, so eating early around 18:00, is recommended. Good French-style bread costs 1,000 rial a medium-size baguette up north, between the French cultural centre and the giant statue marking the entry in Battambang from the main interprovincial road. The bread that street sellers have elsewhere in town is of a much lower standard for the same price, similar to that found in Phnom Penh a baguette-shape, but sprinkled with sugar, however some people do not notice any difference between the bread sold in the north and elsewhere in Battambang. It is generally of decent quality all across the city. You can find insects (beetles, river snakes, etc) fried with sweet soy sauce opposite the Post Office at night or across (from the Phsar Nath market part) the Stung Sangke bridge which is located at the corner and also sells fruits and other amenities. In the daytime, you can find street food at Phsar Nath or better, at Boeung Chhouk market near the inter-city bus area. Every night you will find a long row of food stalls opposite the Post Office by the river. Less touristy, cheap and some stalls have menu in English. KC Burgers, Tenders and Fries! Hotel Royal, (On a side street west of the central market), ☎ +855 16 944955. Rooftop restaurant. Spacious rooms with bathroom, hot water and air-con. Clean singles and doubles available with shared bathroom and toilets. Wi-Fi working in most rooms + rooftop. Very helpful staff who speaks good english. Free cold water on arrival (but you might have to remind them!!). US$7-25. edit I had a problem with a motorbike rented from here. However, the manager handled the situation very professionally. It you are renting a motorbike or a bicycle, your guesthouse will most likely insist that you park inside the building during the night. Enquire with the guesthouse as well as with the rental place on the best way, as well as if you should leave your helmet on the motorbike or take it with you every time you park. There are some times designated places for motorbikes around town with a person issuing tickets, and although Battambang feels safe for travellers, theft is not uncommon in the city. As with most of SE Asia, bag-snatching from women is probably the most common crime. This is more common with women on motorbikes. Burglaries happen opportunistically also. Siem Reap - By boat, every day, will pick you up from the hotel. Ticket available at your hotel/guest house. Cost 18USD (November 2015) for 6/7 hours depending on the boat. One or two stops for food in the fishermen villages. Arriving in Siem Reap, you will have to take a tuktuk to the center which is quite far, 4/5USD per tuktuk. Bangkok - Buses every day, will pick you up from your guesthouse at 8am. 15 USD (July 2015). Capitol Bus booking direct price is $13, Dec 2018) Buy ticket directly from your guest house. You will be dropped off at a travel agent in Poipet, who will take your ticket and will stick a colored sticker on your shirt (red or green depending on the company). You will then be driven for a few hundred meters to the Cambodian immigration. Despite all claims that "we will walk you through", you will have to clear Cambodia exit and Thailand entry by yourself, like everyone else. On the Thai side somebody will spot you on the left sidewalk, just keep walking straight. Look for other travellers with stickers irrespective of colour. They will put you in another bus or minivan that will hopefully take you to Khao San Rd in Bangkok arriving 5pm or later depending on traffic. As of April 2017 the service from Capitol Tours still exists (be sure to insist on going to Bangkok by Capitol when conferring with your hotel for the other companies suffer from crushing reviews on the internet). On this occasion, the traveller was fetched at the hotel by minivan at 7:40, driven to a bigger bus that went to Sisophon and after yet another change there the bus reached the border at around 11:30. Beforehand, an employee of Capitol handed out the common stickers stating not to lose them. Then he took the travellers to the offices on the Cambodian and Thai side, leaving them on their own there. Dealing with the authorities was easy. Upon receiving the permission to stay in Thailand, the same guy waited on the Thai side and lead the group to a little wagon that went to the station where yet another minivan was waiting to make way to Bangkok. Arrival time in Bangkok Ekkamai: somewhere between 16:30 and 18:00. On this occasion the journey was hassle-free, well organized and nothing to worry about. The usual price seems to be 13 USD but guesthouses and hotels may apply a minor charge (April 2017). This page was last edited on 14 April 2019, at 07:57.